Restaurants and bars throughout Santa Monica are offering up an eclectic mix of Happy Hour Specials. From drink discounts to $5 appetizers, it's the perfect way to explore Santa Monica's flavor palate with prices worth toasting to. 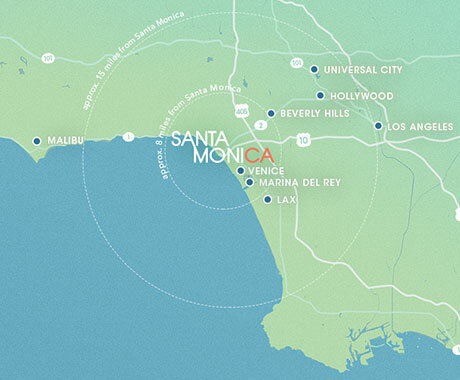 Don’t limit yourself to one location, try out a few Santa Monica happy hour locations. Are you a Santa Monica restaurant or bar with a happy hour to share? Submit your happy hour here. $3.50 selected drafts and $4.50 well drinks. Drink specials include great prices on sake, beer, wine and specialty cocktails. Good deals on Benihana Bites, specialty rolls and selected hand rolls. $4 well drinks, wine, craft and premium beer and $3 domestic beer. $5 mimosa, $7 Bloody Mary and selection of $5 meals. 2-for-1 drinks everyday. Come join us for our Happy Hour and daily food & drink specials in a fun and festive environment. $5 off cocktails, $4 off wine, $2 off beer and food. $8 selected cocktails. $7 to $9 for wine, beer & sangria. $3 to $11 for French, Italian & Spanish appetizers. Special happy hour menu items, $4 draft beer, $9 top shelf margarita, $5-9 small plates. Special happy hour menu items, $5 beer, $8 wine by the glass, $8 classic cocktails and $1.79 daily cocktail (only available 5:30pm-6pm; one per guest). Special prices on small plates and drinks in the bar or garden. $4 beer and $6 glass of red or white wine. $6 wine and sparkling, $6 well spirits, $6 craft cocktails, $4-$5 draft beer and $6-9 appetizers and burgers. Half-price on selected wines and beer by the glass. Enjoy bites, beer, and wine for $3, $5, and $7 at Sumo Dog, Azulé Taqueria, STRFSH and Paperboy. Why limit yourself to one happy hour when you can choose from four different menus all under one roof! More info here. $6 selected cocktails, beer, wine by the glass. Available at the bar and lounge area. Great drink specials, one-of-a-kind patio seating, $5 draft beer, sangria, well drinks, house wine, hot sake and sake bombs. $3-10 food options are available as well. Special priced appetizers and drinks in the pub. $6-8 on appetizers and small plates $5 house wines, $4 beer. Vino headlines at Bodega Wine Bar, where wines by the glass and soju drinks are $6. Local pints ring up for $4, along with deep discounts on wood-fired pizzas and apps like tangy wings. $5 well cocktails and tap wine. $3-8 appetizers. "20/20" wine tasting, sample tasting pours of the 20 different rotating wines in a broad range of styles that are offered at the bar for $20. $5 mimosas and Bloody Marys. $4 house margarita, $20 margarita pitcher and good prices on small plates. cocktails, $4-9 small plates. The restaurant boasts 16 choices on a $10-and-under “bar eats” menu. Lamb nachitos and Thai peanut noodles pair nicely with eight signature cocktails, a sparkling wine, and a double IPA, all $6 apiece. $2 tacos Mondays and Tuesdays, $3 fish tacos Thursdays and Fridays. $4 off any margaritas, $3.50 any beer including draft, $2 off any appetizers, and $6 sangrias Monday through Friday. VICE HOUR - Enjoy happy hour in style at Viceroy Santa Monica's "Vice Hour" (happy hour 5-7 p.m. EVERYDAY), during which EVERYTHING is 50% off. 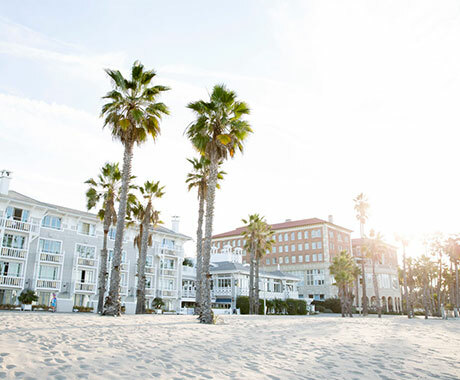 Order cocktails with a side of hors d'oeuvres in one of Santa Monica's most adored hotels without breaking your budget. Every Thursday, there is also a DJ, and select cocktails are $2! $6 beer and wine and $6 appetizers. $2-6 appetizers, $8 specialty cocktails, $6 house wine, $4 beer of the day. $1 oysters, special priced small bites and discounted libations including $5 draft beer, $7 specialty cocktails and $6 house red and white wine. The menu features several of the most popular menu items including Roasted Garlic Hummus, BBQ Ribs & Fries, Grilled Flatbreads, signature Brussels Sprouts with Bacon and Maple & Buffalo style Meatballs. Mondays from 3pm-close is Burger Monday! Order any gourmet New York Sirloin Burgers and a tap beer for $16. Well drinks are $5, Tavern Margaritas $6, wines on tap $3 off and $2 off all tap beers and Jfat Cocktails. $5 beers, $6 glasses of wine, $7 spritz and $12 food specials that include a beer or glass of wine. $5 well drinks and house wines. $2 off all draft and bottled beers. 1/2 off sushi. $5 red or white wine, $5 strawberry fizz and happy hour prices on small plates. $5 selected drinks and $3-6 appetizers. Special prices on drinks and appetizers. Bar Menu 4:30pm to 6:30pm in the bar area. Enjoy the relaxing sights and sounds of the Pacific Ocean over handcrafted cocktails, refreshing sangria, small plates and our daily live music. 50% off our select dinner menu items, cocktail menu and wine list. Succulent bar bites available for $7-9. $8 specialty cocktails drinks. $6 wine by the glass.